896HD, PCI/ISA + Rack Soundcard from MOTU in the 896 series. theaudioandvideoguy's review"18 ins and 22 outs"
The Motu 896 HD is a fire wire interface, it is also rather a big unit so don’t expect just to sit this on your desktop. I am pretty sure that I twill take up more than one rack space if I can remember correctly and if you don’t have rack space in your studio then I don’t recommend purchasing this because you really wont have anywhere to put it at. The price of this interface is pretty steep, but it does have a lot of ins for your to record all of your mics and instruments all together. it’s a really convenient device but only if you don’t plan on making it a mobile interface. It is not mobile at all and belongs in a studio setting racked up. It can also be used on a stage if you need it to be , it actually seems like it was built for a live stage setting if you ask me. It has 18 inputs and 22 outputs, it has the main outs for your monitors or speakers and outs for your headphones. The greatest part of this interface I that it has an on board mixing feature, I never really had the chance to get into depth with this feature though just because I really would rather mix on my DAW and with a lot of different plug ins. I am not sure about the manual with this device, when I was using it I didn’t have a manual which was part of the reason that I couldn’t use the Motu 896 HD to its full potential. I had several questions about a few things while I was using it and just didn’t have a manual to do these things. If you can afford to purchase one of these I say go for it if you have the space. If you don’t have the space you don’t need this type of unit because there are a lot of ins and outs. that’s only for bigger projects and if you just need to inputs there really isn’t a point in having this. I didn’t need to have it at home, its in the local studio. 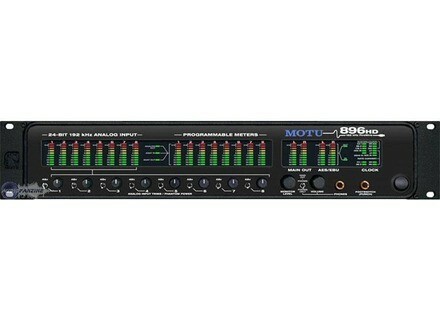 The MOTU 896 HD was the first audio interface I bought when I wanted to get into digital recording with my computer. I was running it with a Hewlett Packard lap top with a 3 Ghz processor and 2 GB of RAM and using Cubase SX as a sequencer. 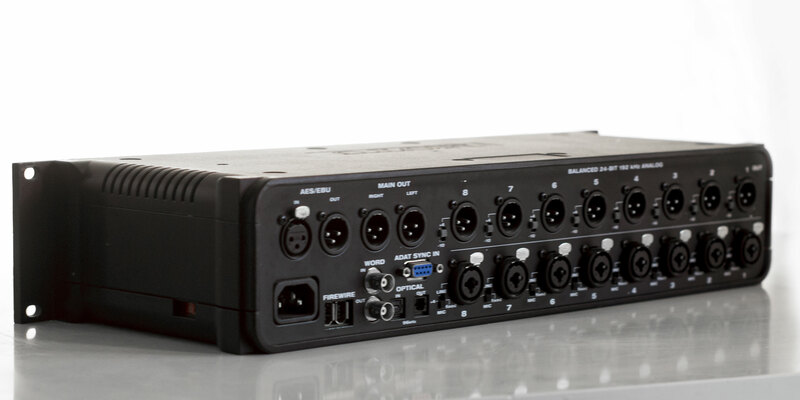 It has eight XLR input based preamplifiers and then has eight more ADAT inputs and outputs and also has a AES/EBU connections. Setting up the MOTU 896 HD was quick and painless. I had no compatibility issues and was able to have the unit up and running with my machine within minutes. The general configuration of the unit is simple and easy to follow, which makes it easy to manipulate and to learn what everything does. The manual is complete and through and is useful when setting up and using this audio interface. I ran the MOTU 896 HD with Cubase SX without any problems. The drivers were stable and are updated pretty often. I was able to record without any latency, as this machine does all of its processing within the unit, freeing up space on my computer. I was able to record at least ten tracks at once, sometimes more, which has more to do with my computer I think, but being as fast as this interface is, it definitely helps to run everything quickly and smoothly. I bought the MOTU 896 HD about four years ago, but I have since switched to a Pro Tools based system with a different audio interface. The reason I switched had nothing to do with this unit, as I think this is better than the audio interface I have now - a Digidesign Digi 002 rack version. The reason I switched was simply because I need to run Pro Tools. If you don't use Pro Tools, this is one of the best home studio audio interfaces you can get. The preamps aren't the best sounding, but are definitley usable and will get a pretty clean sound. One of my favorite parts about this is the metering, as it is extremely clear and looks great! This interface worked great for me while I had it, and if I could run Pro Tools with it, I would still have it. Highly recommended for those looking to put together a computer based home studio with an audio interface like this one. IT HAS EVERYTHING I NEED FOR MY COMPLETE SETUP. I COULD SERIOULSY JUST PLUG IN AND RECORD FROM ANYWHERE. I HAVE IT SETUP ON MY STUDIO DESKTOP AND ALSO ON MY LAPTOP. ITS NOT REALLY BIG BUT ITS NOT SMALL. ITS A COMPLETE PACKAGE JUST PLUG YOU MICS AND YOUR MONITORS INTO ONE SYSTEM AND THERE YOU HAVE IT. DONT EVEN NEED AN OUTSIDE MIXER. UNLESS YOUR USING ANY TYPES OF PRE-AMPS OR ANYTHING LIKE THAT. ALSO HAS A ON BOARD HEAD PHONE INPUT SO YOU CAN LISTEN TO YOUR MIX AND WHATS GOING ON. REAL EASY TO USE WAS UP AND RECORDING THE NEXT DAY I GOT IT. MAKE SURE YOU HAVE ALL THE PLUGS YOU NEED!! I DROPPED IT ONCE AND ITS STILL TICKING. (AT LEAST I THINK IT STILL SOUND GOOD.) NO PROBLEMS AT ALL. HAD IT FOR ALMOST A YEAR. IT IS A REALLY GREAT PRODUCT. HANDS DOWN FOR ME HAS DELIVERED THE BEST SOUND IT CAN RECORD UP TO 192KHZ ONLY IF YOUR COMP CAN HANDLE IT. I ONLY WISH THE SOFTWARE WAS A LITTLE MORE IN-DEPTH THOUGH. MY LOVER PRETTY MUCH. WE HAVE RELATIONS EVERYDAY OF THE WEEK. SHE LIKES IT WHEN I TURN HER KNOBS. - What technical features/characteristics motivated your choice? This unit can record at varying bit-depths and sample rates, all the way up to 24-bit/192khz, which is about as good as it gets right now. It has 8 audio inputs with preamps and phantom power which sound very good and transparent. The front panel meters are generously sized so it's easy to monitor levels while recording. Firewire connectivity makes it very portable and easy to set up. It's a fantastic converter box for any home or project studio. I use this as my main converter for my studio. - What is your Setup (Mother Board/CPU/RAM/Disc,...)? I run Sonar on a Windows XP system with an Intel motherboard, dual core Intel processor, 4GB of Ram, an 80GB Raptor hard drive for audio and 3 500GB data drives. - With what instruments or systems (console, preamp,DTD...) do you use it and what connection types are there ? I use it as a converter as a DAW and sometimes for its preamps. I also use it with outboard preamps, as the audio inputs are variable and can be set to accept line level audio. 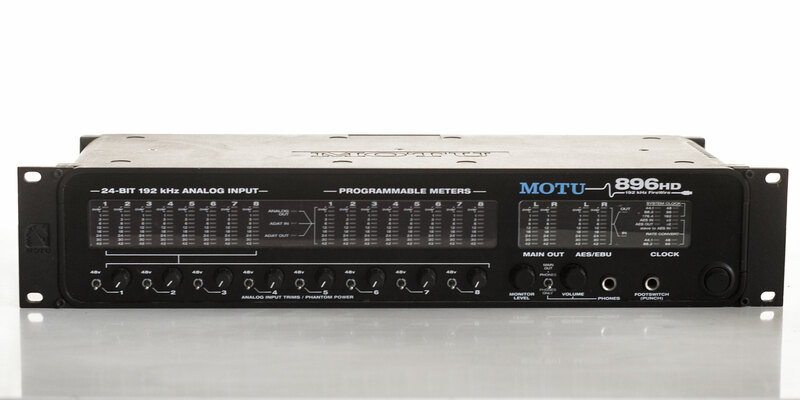 In addition to microphones, I have run basses direct into the preamps on the MOTU, and it worked fine. The 8 audio inputs are combo connectors, so you can use XLR and 1/4&quot;. - Did it install without any problems? Installation is extremely easy - install the driver and plug in the firewire. No problems. MOTU is great about providing drivers for a wide variety of OS's and audio formats. I had no compatibility issues. It is. The basic uses of the unit are very intuitive - though there are more advanced features if you care to peruse the manual - such as using the device as a live sound mixer. It is very much so. I've never had any problems with the drivers, this unit is very reliable. MOTU seems to be quick about offering patches or new drivers when any problems arise, but since I've owned this unit I've had no problems. - Which software do you most often use? Windows XP and Cakewalk SONAR. - How much latency are you getting? Doesn't really apply - although the MOTU offers Zero Latency monitoring, using the included CueMix software. 8 Tracks recorded simultaneously, and as many as your computer can handle for reading. I've been using it for about 3 years. I love the clean, transparent sound, the great metering, the portability, and it's a great value. I really don't have much to say negatively about it. I have worked with other competing models, such as the Mackie Onyx converter, and found the 896HD to be the best value in the ~$1000 price range. Absolutely. 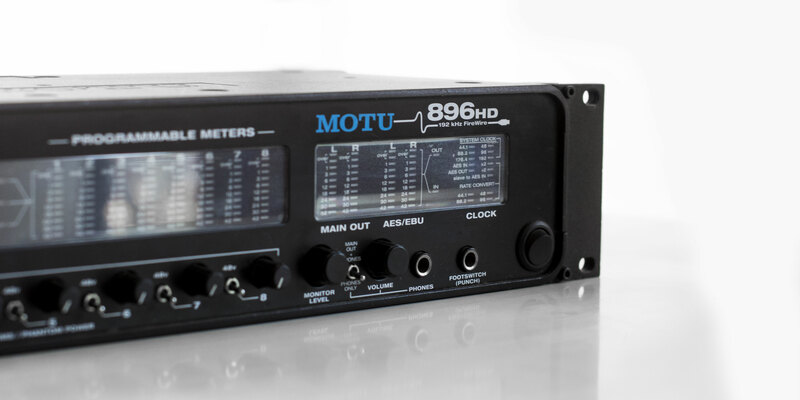 However - MOTU just released the 896mk3, which is basically an updated version of this unit. So I would advise buyers to go for the 896mk3 now, as it has more features.